Rebecca Malope is a South African gospel singer and television personality who rose to fame after winning the 1987 Shell Road to Fame competition. 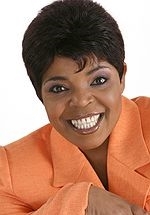 She is best known to television viewers for hosting the gospel music show It's Gospel Time, featuring gospel music videos, profiles of artists and groups, gospel music news and discussions on related topics. In 2012 he was announced as one of the three judges for the Mzansi Magic reality competition Clash of the Choirs South Africa, which aired in 2013.